A couple of weeks ago I ventured to Annapolis for the day to go to a book signing with Giada De Laurentiis. I met one of my oldest girlfriends up there, and we waiting in line together at Williams-Sonoma for a couple hours. We chatted about the past, and how we’ve transitioned into the future with our families of two little boys. It was a great morning, topped off by meeting Giada – who was just as gorgeous and sweet in person as she is on television. We of course flipped through the book while we were waiting, which is all healthy recipes – along with lots of health and beauty tips, and there were many recipes I bookmarked to try. The first one I got around to testing out in my kitchen was this delicious pork tenderloin with a honey-mustard sauce. We are big fans of pork tenderloin in this house. It’s a protein that’s lean and healthy, but still juicy with tons of flavor. Then to top it of with a delicious pan sauce? It’s just the icing on the cake! It’s also pretty quick-cooking, making for an easy weeknight meal. The tenderloin is seared off in the pan, to get a gorgeous brown crust on the outside – then finished off in the oven. A quick pan sauce is made by using the browned bits in the bottom of the pan – along with a spot of wine , Dijon mustard, honey, and fresh herbs. I served with some roasted red potatoes and fresh green beans, and everyone really enjoyed it. I also picked up a signed copy to share with one lucky reader! Just leave a comment below telling me what is your favorite recipe from the lovely Giada De Laurentiis that you’ve made in your kitchen? Giveaway will run from today, until next Friday at 11:59 PM. Position an oven rack in the center of the oven and preheat the oven to 400F. Spray a heavy baking sheet with vegetable oil cooking spray. Season the pork with the salt and pepper. In a large skillet, heat the oil over medium-high heat. Add the pork and brown on all sides, about 8 minutes. Transfer the pork to the prepared baking sheet and bake until a meat thermometer inserted into the thickest part of the meat registers 160F, about 20 minutes. Allow the meat to rest for 10 minutes on a cutting board before slicing 1/4- to 1/2-inch-thick slices. In the same skillet used for browning the pork, heat the oil over medium-high heat. Add the onion, salt, and pepper. Cook until soft, about 3 minutes. Add the garlic and cook for 30 seconds. Pour in the wine and use a wooden spoon to scrape up the brown bits that cling to the bottom of the pan. Simmer for 1 minute. Whisk in the honey, mustard, vinegar, and thyme. Simmer until thickened, 2 minutes. Remove from the heat and stir in the butter until melted and smooth. Top the pork slices with the honey mustard sauce and serve. Congrats to entry #17, Tracey! She loves Giada’s turkey and artichoke stuffed shells. I’m going to have to try that recipe myself. I hope you enjoy this new cookbook as much as I have been! We love pork tenderloin, too. This looks fabulous. My favorite Giada recipe is avocado hummus, it was so excellent! I’ve made her parmesan crusted pork chops (with slight variations) more times than I can count! Her alfredo sauce is awesome. I love to make her polenta–so, so good. Giada’s cheesecake that she makes using some mascarpone instead of one of the blocks of cream cheese forever changed the way I make cheesecakes! So rich and creamy! I love Giada! Her lemon spaghetti is amazing! I make lemon almond blueberry cookies that I saw Giada make years ago, so good. I love her chicken parm! I haven’t made it yet, but her breakfast tart with pancetta and green onions is on my must-make list. I have quite a few Giada favorites. One that I come back to often is her Beef and Cheese Manicotti. She has a shrimp linguine with lemon oil dish that is to die for! I’ve made her Chicken Piccata and it’s one of my favorites! What fun going to a book signing! That looks incredible! I haven’t made a recipe of Giada’s that we haven’t loved. Our favorites are her risotto in a lemon cup and flat iron steak with red wine gravy. Her chicken vesuvio, for sure. Ok, favorite Giada recipe – turkey and artichoke stuffed shells. Love them! 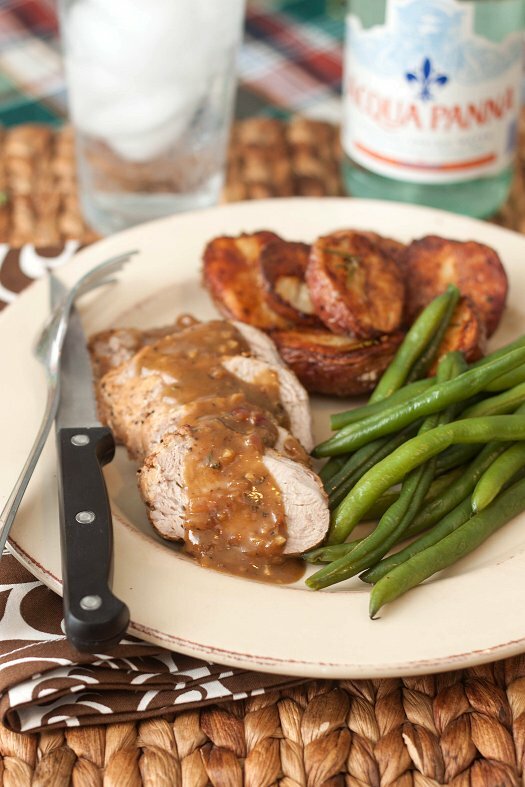 I am so making your pork tenderloin recipe for dinner tonight! My favorite Giada recipe is her butternut squash lasagna. It is so goooood! I think we will try this today. I have not tried any of Giada’s recipes yet, but this one looks pretty good! It must be true that all Italians love to cook!!! !